"Hours after the Twin Towers fell, he began tracking the story, until he became part of it." 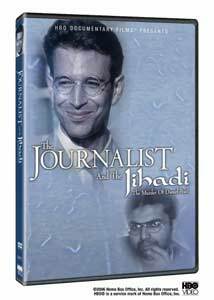 When Wall Street Journal reporter Daniel Pearl was kidnapped and murdered in Pakistan in 2002 by Islamic extremists, the reverberations of that act's singular brutality were difficult to ignore. There was the now familiar grainy hostage photo and video, showing a gun held to the bound Pearl's head, followed soon by the discovery of something far worse, an actual execution tape, one that explicitly depicted his death by beheading. It was one of those very up-close-and-personal news events that seemed to live on larger than life as tensions between the United States and the mercurial force of Islamic extremists continued to escalate, and it was not until March 2007 that imprisoned 9/11 mastermind Khalid Sheikh Mohammed told a U.S. military tribunal that he personally had beheaded Pearl. Or so he says. In The Journalist and The Jihadi, filmmakers Ahmed A. Jamal and Ramesh Sharma attempt to overlap the lives of Pearl and the man believed to be his kidnapper, Omar Shiekh, until they eventually overlap in Karachi, Pakistan. We are shown home movies of Pearl as a child, and we hear from his family as they fondly recall his budding musical talents and how he decided at a young age that he really wanted to do something important with his life. His journalism career was clearly about more than just writing a news story, and he is referred to throughout as a humanist who sought to try and expand the boundaries of cross-cultural knowledge to the rest of us. In short, the guy seemed to have it all going on, and watching his short future unfold just seems achingly wasteful. The flipside here is about the jihadi Omar Shiekh, whose story is understandably less open, so there's is a little fuzziness surrounding some parts of his life. Some of the footage, such as clips of him arm-wrestling in a London pub are surreal and a little odd, as Jamal and Sharma do their best to connect the dots on Shiekh's eventual rise in the ranks of what the West views as Islamic extremism. His privileged upbringing and education in London make his actions seem all the more disjointed, even as one person politely recalls that Shiekh's "manners were impeccable". Unlike the life of Pearl, Shiekh never seems more than a casually defined cipher here, something that gives a slight imbalance to what could have been a more evenly split narrative. At the time of his death in 2002, Pearl was playing a game of what is known as "follow the money", attempting to track down the funding of the 9/11 terrorists, which is what brought him to the attention of Omar Shiekh in Pakistan. Using interviews from state department officials, federal agents, assorted Pakistani contacts and Pearl's wife (along with narration by CNN's Christiane Amanpour), Jamal and Sharma use the second half of their doc to retrace the steps up to the kidnapping. We're shown how Shiekh adopted a phony persona to trick Pearl over a period of a couple weeks into believing he would land an interview with a key figure, which in reality was just a grand setup for his own kidnapping. For the most part Jamal and Sharma seem to do what they had set out to do, which was apparently to show two converging sides of a volatile international story. The revelations about Pearl's life, and the way he lived it, is the saddest part of this whole thing, and unfortunately all the revisiting of what occurred won't make it end any differently than it already did. I did learn about more about Pearl the man here, and that is a commendable and heartbreaking journey, yet the overall experience of watching this film only served to anger and disturb me over the slaughter that continues to go on in the name of religion. And that holds true no matter which side you're on. Image Transfer Review: Jamal and Sharma's doc is presented in its original 1.33:1 fullframe, and as it consists of a wide range of source material occasionally there is a variance in image quality. Some minor grain in spots, but typically a clean print that carries warm colors and well-defined edge details. Audio Transfer Review: The 2.0 surround track provides clear voice quality, and music elements that utilize the rear channels to modest effect. Given the topic, the newsy presentation isn't necessarily intended to be an overtly gaudy one, so the lack of any broad dramatics isn't really a detriment. A Spanish language 2.0 dub is also included. Extras Review: A real missed opportunity here to fill in the history since Pearl's death, but there are no extras at all here, just the disc and the 16 chapters it is divvied up into. As a tragic story, Jamal and Sharma's documentary does its part to retrace the chronology and try to give some insight into the key players�in this case Daniel Pearl and Omar Sheikh�and how their paths eventually crossed. Compelling and heartbreaking, it ultimately ends as we all know it will, making the journey a tough one to want to take willingly.